The Rosewood Services equestrian therapeutic program is nationally acclaimed and therefore, the Rosewood Ranch is a popular place for people to visit. The Ranch has received many guests over the years, since our agency opened the equestrian therapeutic program in 2002 as a unique therapy option for people with developmental disabilities. Visitors have come from all over the United States and from other parts of the world, like the Netherlands and Africa, to tour our Ranch and its excellent facilities. Some groups, like Helping Hands Preschool, Great Bend, have visited Rosewood Ranch annually for many years, as a way to experience ranch life. 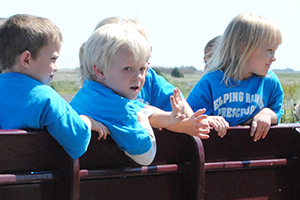 Interacting with horses and taking horse wagon rides are typically popular activities for the youngsters. “Children are very visual, so field trips are a great learning experience for them when we tie them to the learning we are doing in the classroom,” one teacher explained during a visit by her students to Rosewood Ranch. For several consecutive years, Ranch manager Eric Hammond and staff have served as “Fieldwork Educators” for Occupational Therapy Assistant students from Brown Mackie College, Salina. During one Saturday each June, Rosewood Ranch is turned into stomping grounds for a gathering of energetic cowpoke kids. Children with disabilities who receive riding therapy, their siblings and the children of Rosewood employees are able to spend three hours riding horses, taking wagon rides, and playing games. Those who attended the event are treated to free hot dogs, chips, snow cones or sundaes, and drinks. Rosewood Ranch has served an important role for many years by being involved annually in Great Bend’s “Home For The Holidays” Parade. Each November, a Rosewood horse-drawn carriage brings Santa and Mrs. Claus down Main Street to the courthouse square to the thrill of hundreds of children and kids at heart who are in attendance. Rosewood clients also participate in the parade, riding in a wagon, led by a team of Ranch horses. After the parade, Rosewood provides wagon and carriage rides to people through downtown Great Bend. While Rosewood Ranch welcomes visitors, we do require advanced notice. In order to schedule a tour, you will need to contact Rosewood Ranch manager Eric Hammond, 620-786-1693 (cell), or e-mail him at coosa@rosewoodhorseranch.com.